KoopaTV: Who To Vote For? A Week Until Mid-Terms 2014! By LUDWIG VON KOOPA - Mid-terms as in midway through the presidential cycle. Not, you know, a mid-term exam. I was thinking about only writing an article on November 4, 2014 telling you to vote. But if I'm really serious about trying to turn out your vote, then I should give you a one week notice, right? If you are an American citizen 18 or over as of November 4, you are eligible to vote in this election. Who is up for election? Every House seat in the country, a third of the Senate, and... a lot of the governors. But if you are not currently registered to vote, then you're... not eligible this time. UNLESS you reside in this lucky list of states that allow same-day voter registration. That means you can register to vote and vote. On the same day! Where do you vote? Go to your favourite search engine, put the name of your state and "Secretary of State". So if you live in Georgia, put in "Georgia Secretary of State" which will lead you to their site. Then it should have in a prominent location information about voting and elections. Click that. You should be greeted with a bunch of information that will let you know who is running, what the ballot will be like, and the location of voting (you can input your details into the look-up that should be there) and anything you might need to know or bring with you. 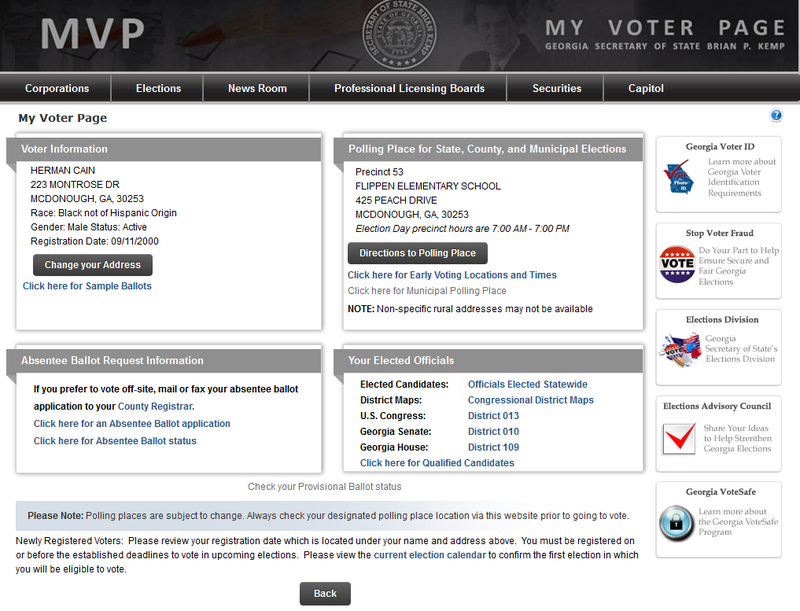 Herman Cain's voter information. ...By the way, he didn't supply this, I got it myself. Creepy, right? It's all dandy that you're armed with that information, but how do you vote? If you haven't been following the politics in your area, you might be confused or uninformed. So what to do? Step 1: Disregard every TV, web, or radio ad you've heard up to this point regarding elections. Step 2: Since you know who the candidates are because you went to the Secretary of State's site, go to the candidates' website and look through their issues. Figure out what resonates with you. Step 3: Optional, but go ahead and look up some debates or articles featuring the candidates. This is different than their website because they are either under pressure and have someone else (their opponent) who can try to set them straight, or the article-writer should be more objective than the candidate. Step 4: If you do not know what is important to you or something seems suspicious, ask Ludwig in the comments section about it. Obviously, I'm asking you to consult an incredibly biased set of sources (the candidates will say how great they are, and I'm a right-wing nutjob) but those biased sources are trying to pander to their base. If you feel affiliated with that base of support, then you'll be at home. If you're confused, chances are I know enough about it to give a detailed answer. An answer with the facts, and then an explanation of my thoughts on it. For a blanket, lazy way out: For Congressional races (United States Senate and United States House of Representatives — federal offices) vote Republican. For your state offices, vote whatever you want. Voting Republican or Libertarian is probably the best. If what I just said about the difference between federal office and state office confuses you, feel free to inquire about it. There might also be additional things besides candidates that are on the ballot. If your Secretary of State did a good job, these should've been mailed to you already. If not, they should be on their website. These are Questions that relate to your state, and they're specific to each state. They come from interest groups in your state that managed to get enough signatures for their issue to get on the ballot. These might range from "cut state taxes" to "we should legalize gay marriage", so be sure to know what they are before you vote. If you don't know how to vote on these, go ahead and comment in the comments section what's on the ballot and I'll explain it to you. You can decide for yourself what you value. One thing I did not answer is "Why should I vote?" I don't have anything original to offer there. You can't complain if you don't vote. If you want change or want to stop change, vote. I vote, and that's why I get to complain all the time on KoopaTV! ...That said, if you don't vote, videogame companies are still going to release their games and stuff. Although, hey, maybe it might get harder or easier to do so if some policy-making is made on that front! Ludwig votes for the Royal Koopa Family in every election, keeping himself and his father in power within Koopa Kingdom. Either way, he's interested in races across the United States, so leave your comments if you want his insight on your specific one. Ludwig DID end up writing an article on November 4 telling you to vote. Awkwardly enough, Ludwig criticises Donald Trump for doxxing another presidential candidate. Voting might not matter because it's all rigged anyway. Also the footer in this article is facetious, since there are no elections in Koopa Kingdom. Mid-terms 2018 came up. Go vote in those too.